If you are looking for an alternative to cooking with lard or butter, consider trying cottonseed, sunflower or soybean oil. These versatile and healthy vegetable oils are derived from plants grown in different countries and climates. In addition to providing oil, these seeds are a source of food for people and animals, clothing and textiles, industrial chemicals and biofuel. Cotton, sunflowers and soybean oils differ in their nutritional profile, suitability for cooking and in their taste. Cottonseed, sunflower and soybean oil are liquid at room temperature. This is due to their low saturated fat content. You can use each type of oil in salads, fried or baked goods. Each seed oil is high in polyunsaturated fats, such as omega-6, omega-3 and omega-9 fatty acids. Omega-6 and omega-3 are essential fatty acids. Because your body can't make them, you must get them from your diet. Each oil is produced in a two-step process. First, the seeds are crushed or compressed to squeeze out the oil. The remaining oil trapped in the seeds is extracted using a solvent, such as hexane. The oils are then further processed to remove water and impurities that might affect their flavor, shelf-life or heat stability. Cottonseed oil has about 25 percent saturated fat, with a 2 tbsp. serving having 7 g saturated fat, 4.8 g monounsaturated, and 14.1 g of polyunsaturated fat. The primary fatty acid in cottonseed oil is omega-6 or linoleic acid. Cottonseed oil doesn't break down as quickly as soybean or sunflower seed oil when used in frying. This makes it a better choice for the commercial food and snack industry. There are four types of sunflower seed oil with differing mixes of saturated and unsaturated fats. High linoleic sunflower seed oil contains 68 percent linoleic or omega-6 fatty acid and 21 per cent oleic or omega-9. The remainder is saturated fat. The sunflower seed oil you buy in the store is mostly mid-oleic which has about 26 percent linoleic and 65 percent oleic acid. High oleic oil has 82 percent oleic and 9 percent linoleic acid. The fourth type is called high stearic/high oleic oil, which comes from hybrid sunflower seed which yield naturally, hydrogenated oil. High stearic contains 72 percent oleic acid, but the 18 percent stearic acid it contains makes it an alternative to shortening or other hydrogenated oils that may contain more saturated fats. Soybean is the most common vegetable oil in the U.S. Soybean oil contains emulsifiers that help stabilize oil-and-water mixtures, such as mayonnaise and salad dressing. 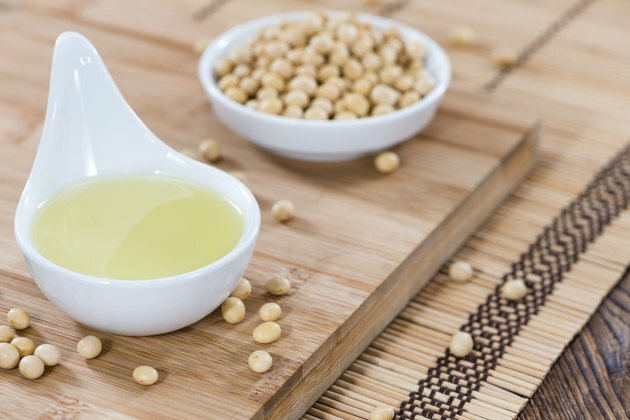 Soybean oil is the only one of the three that contains the omega-3 acid alpha-linolenic acid and omega-6. Like omega-6, ALA may protect your against heart disease and stroke by lowering your low-density lipoprotein cholesterol and raising your high-density lipoprotein cholesterol. Add soybean oil to your diet if you can't eat omega-3 rich fish or take fish oil supplements.